SPORTMiX® Wholesomes™ Puppy Golden Biscuit Treats are a great reward for your puppy or a perfect training aid. SPORTMiX® Wholesomes™ Puppy Golden Biscuit Treats help your puppy’s teeth remain clean and healthy. 20 lb. box. Particles in soft foods frequently stick to the teeth of puppies. This results in tartar build-up and bad breath. The hard, crunchy texture of SPORTMiX® Wholesomes™ Puppy Biscuit Treats helps avoid this problem while satisfying the chewing needs of puppies. When used daily, these biscuit treats can help effectively remove loose food particles and tartar supporting healthy gums. 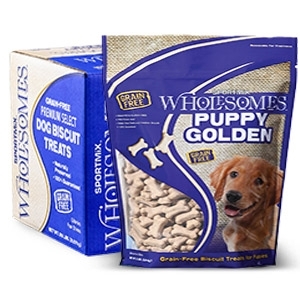 SPORTMiX® Wholesomes™ Puppy Golden Biscuit Treats are naturally preserved and 100% guaranteed for taste and nutrition.